But that love has certainly weaned off. As the occasional pedestrian and a fellow driver along the roads of Addis, these taxis are a true menace at times. Their snaking around lanes, abrupt stops and the tendency to cut you off are somewhat annoying. There is little regard for the common pedestrian. Although in defense of taxi drivers pedestrians here are something else (at times believing that they too have licence plates attached to their front and back). As the taxis come to an abrupt stop you find a young boy/man shouting the names of the last stop. Their rapid and peculiar way of shouting out names of boroughs around the cities needs a trained ear. For a first timer, as I once was, it was difficult to distinguish what they were saying and where they were going. Today in an effort to regulate taxis the government has imposed predesignated routes and instructed all taxis to place signs over head. Unfortunately all the signs are in Amharic. From my Ethiopian friends, I gather that even those who can read them have had difficulty understanding the final destination as the written names don’t correspond to names of stops previously belted out. 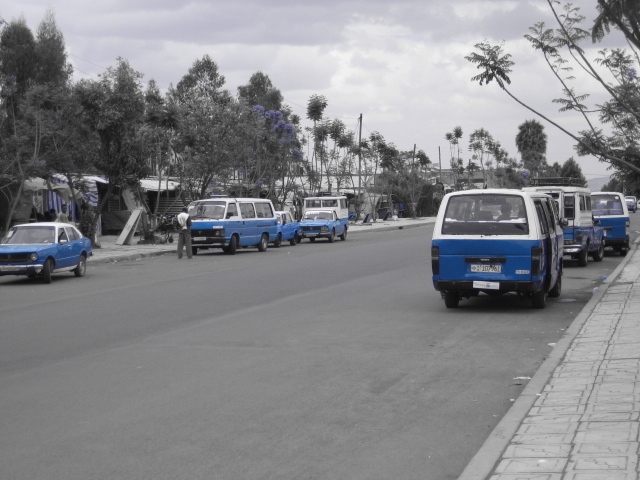 Love them or hate them, these taxis are probably the preferred form of transport around Addis and the most abundant. Many times there aren’t enough and you find people piling up in hoards waiting for the a seat in any taxi headed in their desired direction. One thing is for sure, they definitely keep me as a driver on my toe…because you never know what to expect from them.